2. Click on Preferences from the Mail menu in the top toolbar. 3. Click on the Accounts tab. 4. Within the Accounts tab, click on the plus (+) sign in the bottom left corner to create your new account. 5. Set the Account Type to POP3. 6. Enter your name and email address. 8. Now you will need to configure the incoming mail server. If you have a shared hosting account, insert mail.yourdomain.com (replace yourdomain.com with your actual domain). 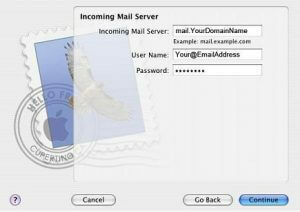 If you use Basic or Advanced Email service, insert mail.papamail.net as the incoming mail server. 9. 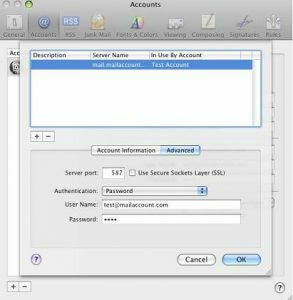 Enter your username and password for your email account. 11. Now you will need to configure the outgoing mail server. If you have a shared hosting account, insert mail.yourdomain.com (replace yourdomain.com with your actual domain). 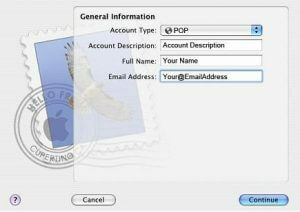 If you use Basic or Advanced Email service, insert mail.papamail.net as the outgoing mail server. 12. Make sure Use Authentication is checked. 13. Enter your email address and password. 1. Click on the Account Information tab. 2. Click within the Outgoing Mail Server (SMTP) drop-down box. 3. Click on Edit Server List. 4. 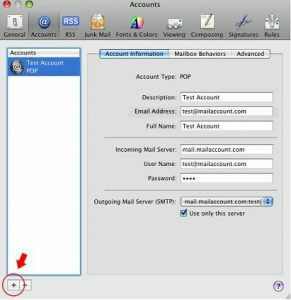 Click within the Outgoing Mail Server (SMTP) drop-down box.